The first time I saw Frida Kahlo was on a pin badge. The stereotypical feature one might associate with Frida, her distinct monobrow, instantly captured my attention amongst an assortment of other badges depicting famous faces of today’s popular culture; Kim Kardashian, Kanye West and Beyoncé featured alongside Kahlo on these overpriced accessories. Shamefully, the inquisitive feeling I had about the face of Frida and who she was exactly, faded. She once again went back to being the face of a woman who I would see numerous times on t-shirts and posters, but I was still in complete and utter ignorance as to who she actually was and the overwhelming impact she has had. It wasn’t until a couple of months later until I realised the magnitude of her influence both inside and outside of the feminist movement. Thankfully now my perception of this remarkable woman has surpassed my first encounter of her in a regrettably commercialised format - an overpriced pin badge of all things. Frida Kahlo was a Mexican artist, a pioneer of the feminist movement through her art within the twentieth century. Kahlo was born in 1907 into a tumultuous period within Mexico in which society perpetuated a policy which sought to promote indigenous values, whilst contradictorily suppressing indigenous origins to encourage ‘whiteness’. From the outset, Kahlo would clearly have to find strength in finding her identity and fighting the oppressive ideology imposed within this period. Kahlo suffered various misfortunes within her life; a bus accident in 1925 left her infertile, and her husband, Diego Rivera, had an affair, leaving her fraught with pain due to his betrayal. When I first heard all of this, I remember feeling an overwhelming sense of sadness and shock at the hurt that Kahlo must have felt. Nevertheless, it is Kahlo’s ability to both represent and evoke this feeling of anguish within her art, alongside her apparent vulnerability which coins her one of the most important women within the feminist movement. Exposing her flaws does not just empower women, but also encourages anyone to find strength within themselves through the misfortunes that they encounter within their life. Henry Ford Hospital (1932) portrays Kahlo at her most vulnerable. Lying on a bed, naked, Kahlo is surrounded by nothingness; only her internal sufferings are shown, highlighting how consuming they are for her. The barren landscape appears to reflect the turmoil she faced in failing to produce a child which both herself, and her husband, Diego Rivera, dreamt of having. Whilst initially, the overwhelming sense of vulnerability and pain that seems to consume Kahlo, highlighted in the explicitness of the imagery used may cloud any feelings of empowerment one may feel, Kahlo shows that vulnerability can prove to be incredibly freeing. Nowadays, I feel that we associate images of pioneers of the feminist movement with women, standing strong, whether this is in the streets, placard in hand, actively protesting against patriarchal oppression, or pictures of girl groups, stood hand in hand, poised, reminding us of the strength and power that women have within; to empower themselves and each other. These visual approaches to strengthen women are crucial in encouraging us to feel strong. Yet with the increasing influence of social media, we are often encouraged to conceal, rather than reveal our flaws on these carefully crafted platforms. Opposing this, Kahlo’s artistry is a reminder that showing one’s vulnerability, flaws, doubts, fears, is an equally empowering way to help women grow. The sadness surrounding her infertility in Henry Ford Hospital (1932) not only exposes the increasing pressure on women to reproduce, whilst simultaneously encouraging us to come to terms with our own insecurities, so that we can acknowledge them and subsequently find strength from them. At the heart of Kahlo’s painting What I saw in the Water (1938) (also referred to as What the Water Gave Me) is its surrealist artistry, which is seemingly used to not only highlight the complexity of the human mind, but also the turbulent characteristics of Kahlo’s thoughts and troubles. 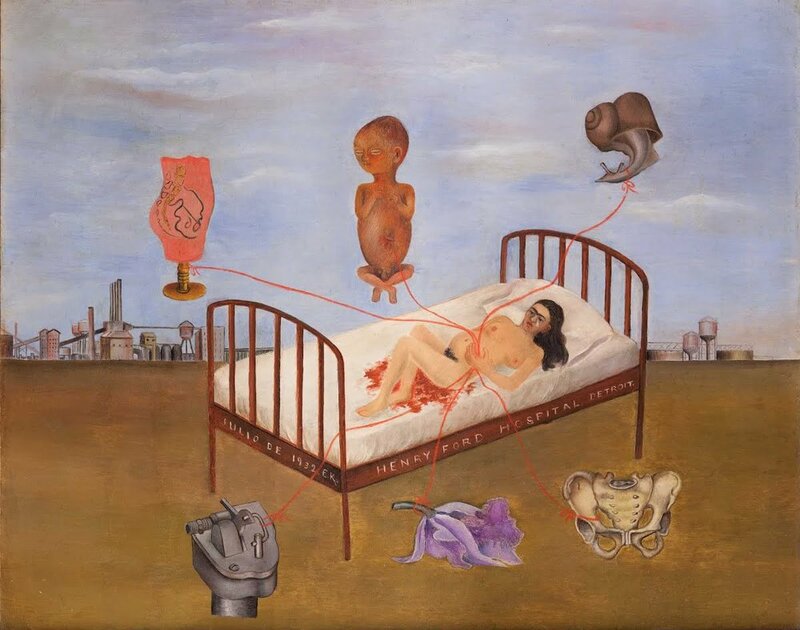 In conversation with her friend, Julien Levy, Kahlo described the painting as "an image about time and childhood games in the bathtub and the sadness of what had happened to her in the course of her life". Here, Kahlo’s vulnerability is associated with aging and maturity as a ‘childhood game’ has manifested into a brutal depiction of the pain Kahlo has faced as she has grown up. This sentiment, revolving around the affinity between evolving and exposure to hard times is a sentiment shared not only by Kahlo back in 1938, but also for many of us in the present day. For many, maturity, as Kahlo proposes, is an opening for greater pain and suffering. Amongst the images shown in Kahlo’s surrealist depiction, the two women shown in the painting are symbolic of Kahlo’s bisexuality, a part of her identity which also made her vulnerable as a woman during her life. Yet, Kahlo’s explicit illustration of the two women lying together, goes against the oppressive idea in the 20th century that bisexuality, or sexuality in general were too taboo to be expressed or even acknowledged in neo-colonial society at the time. Self-Portrait with Cropped Hair (1940) is one of Kahlo’s more overt paintings expressing the vulnerability that comes from a broken heart. After the affair her husband, Diego Rivera, had Kahlo painted this self-portrait as a blatant response to express her sadness and pain, encompassed in the act of cutting her hair. Clearly, this is an act of defiance not only towards what society constituted as ‘feminine’, but also to show the distress that her husband’s actions brought her. As Kahlo writes in the painting: "Mira que si te quise, fué por el pelo, Ahora que estás pelona, ya no te quiero" ("See, if I loved you, it was for your hair, now you're bald, I don't love you anymore.”) Kahlo’s blank expression pierces our gaze, a direct way of showing us the heartbreak she is now consumed by. We too, like Kahlo cannot escape the emptiness she now feels. Yet, her look of despair and hopelessness following her husband’s affair allow those who have also experienced the exhaustion that comes from heartbreak to connect to Kahlo’s vulnerability. Subsequently, Kahlo lets us find refuge in her painting despite the sorrow that often accompanies the exposure to solitude after heartbreak. Consequently, Frida Kahlo shows that it is imperative that we encourage everyone, not just women, to express their vulnerability as a human being in order to grow. Kahlo both tragically and beautifully shows that you must recognise the demons within you that we are so often encouraged to suppress, in order to overcome them. Instead of burying them deep inside, one must confront them and gain strength from the pain we encounter; after all, despite everything Kahlo faced, she has become one of the most influential artists to date through the rawness within her art. She is the epitome of feminist empowerment and human perseverance alike. If I were to go back and buy that pin badge of Kahlo, I would also be committing to wearing something else. In the most cliched way, one might refer to me having to wear my ‘heart upon my sleeve’, but in a more profound sense, I must, as Kahlo encourages, acknowledge and share the things that make me feel the most vulnerable. In doing so, I hope that just like Frida Kahlo, I can find strength within myself and encourage others to do the same.